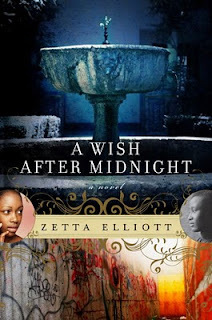 A Wish After Midnight by Zetta Elliott. AmazonEncore Editions, 2010. Reviewed from CreateSpace edition, won in September in the Color Me Brown Challenge. The Plot: Genna Colon, fifteen, lives in a one bedroom apartment in Brooklyn with her overworked mother and three siblings. It's not an easy life: roaches in the apartment, her brother Rico hanging out with drug dealers, sister Toshi doing who knows what, but Genna keeps trying. She gets straight As in school, dreams of college, and finds love with Jamaican born Judah. One night, after a fight with her mother, Genna runs to the local gardens and makes a wish at the fountain. Suddenly, she is back in time. Still in Brooklyn, but as for the time? It's the Civil War. She's dazed, confused, and hurt. The first people who find her don't help; instead, they are two white men who assume she's a runaway slave. The Good: What a page turner! Genna is so engaging, and she is faced with so many challenges as she struggles to survive in the past. Having twenty first century sensibilities in the face of nineteenth century racism? "Hard" doesn't even begin to describe it, as she tries to build a life and friendships in her new time. I don't want to give too many of the plot points away, because seeing the obstacles Genna encounters and how she climbs over, goes around, or moves it is part of the reason this is a page turner. Time travel to the past is a great device to use in looking at the past because it allows the reader to learn about history, yet there is no fear of anachronistic viewpoints because a modern day person is interpreting, reacting to, and weighing in on the past. So, here, the reader learns about life in Civil War era Brooklyn and sees the points of view and attitudes of a variety of characters, but there is always Genna's modern sensibilities weighing, judging, understanding. The Brooklyn of the past comes alive; both in terms of setting (houses, landmarks, waterfront) but also in terms of how people think and act and believe. Part of me wants to go on a A Wish After Midnight tour of Brooklyn; then I remind myself, I don't drive in the city. Genna ends up working as a servant for an Abolitionist family. Happy ending? No; she finds out quickly that just because a person believes in freedom and the end of slavery, doesn't mean that person believes in equality or respect. Elliott is working on a sequel; part of it is posted at her website. Also at her website? Links to additional information on the history found in the book, perfect for readers like me. An interesting point -- Genna's story is not set in the present (i.e., now), but rather in 2001, and it's clear that September 11 is going to be a factor in the sequel. Oh, wow, the new cover is really much nicer. And the fact that Judah is in B&W!! Wow. This book looks fantastic - I love that cover! Great review and a new addition to my wish list! I love this book. I have my new copy and I've already been showing it off! Didn't Walter Dean Myers' publisher put together a Riot tour last fall? I think your idea has potential, Liz, even if you don't want to do the driving.